How the British had difficulty learning the land Revenue system of Desi Nawabs. So, they came up with Permanent settlement (Zamindari), Ryotwari and Mahalwari systems. After the Provincial elections of 1937, Congress ministries took measures to protect tenant farmers. But by and large they shied away from zamindari abolition. After abolition of Zamindari, the (superior) tenant farmers became virtual owners of the land. They owned tens and hundreds of acres of land. While other peasants owned hardly any land. So, State governments enacted land ceiling acts and distributed surplus land to poors and landless. This is second tool of Land reforms. 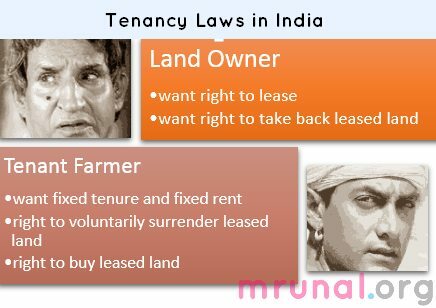 Various State governments have passed the laws to protect the land owners and (superior+inferior) tenants. Collectively these are called tenancy reform acts. They pay Revenue to the State. Rich farmers, Zamindars etc. own hundreds of acres of land. Can’t cultivate it on their own. Similarly minors, disabled, widows, soldiers, fishermen may also own land but they can’t cultivate for one reason or another. So these people ‘lease’ their land to other farmers (tenants). They cultivate on land leased from the ^owner. These are hereditary tenants. Meaning they cultivate same land generation after generation. They pay rent to the owner. They have almost the same rights as the owners. They can sell, mortgage or rent out the land. They cannot be evicted against their will. Other names: tenants at will, subordinate tenants, temporary tenants, subtenants. They till the land leased from other tenants/owners. They pay rent to the owners/superior tenants. They have limited rights over the land. They cannot sell or mortgage the land. They can be evicted easily. They get share from the produce, and remaining goes to the tenant/owner. They have no rights whatsoever on the land. They cannot sell, rent or mortgage the land. Sometimes work under begari/bonded labour. You own land, but you don’t have the time/money/mood/intention to cultivate by yourself. So you lease it to another farmer and extract ‘rent’ from him (=25-30-40-60-75% of the produce). This Land leasing, again leads to system of Intermediaries (middlemen who don’t cultivate) and exploitation of tenants (farmers who actually cultivate). Therefore, in an egalitarian/socialist/communist society: Agri.land leasing=undesirable. But what is the land owner is a defense personnel, widow, minor, student or physically disabled person – they cannot cultivate land by themselves. Hence, leasing is permitted in such exceptional categories of land owners. Andhra Two types of leasing are practiced. In Future, agri.land cannot be leased except when owner is a person with disabilities. sub-lessee does not acquire the right of occupancy of the land. Gujarat Leasing is prohibited except for Defense personnel. Himachal Agri land cannot be leased. Except when landowner is a minor or unmarried or a widow or divorcee or disabled or defense personnel. Karnataka Agri.Land cannot be leased except when landowner is seaman or soldier. Uttar Pradesh Agri. cannot be leased. Except when landowners are widows, unmarried women, military persons, students and disabled persons. West Bengal Leasing is prohibited, but share-cropping is allowed with some restrictions. As we saw in Element#1: Many states permit agri.land leasing (at least when landowner is a soldiers, widows, minor, physically disabled). But what if landowner himself wants resume cultivation later on? e.g. soldier comes back to village after retirement, or the minor student becomes an adult, or the widow gets remarried. State Law Can Landowner take back land from Tenant, for personal cultivation? Andhra Yes but not more than 75% of the leased land. Kerala, Orissa, Gujarat, Himachal Pradesh, Maharashtra, Karnataka and Tamil Nadu, Manipur, Tripura Yes but not more than 50% of the leased land. So far we saw two elements that protect the rights of landowner viz (1) right to lease and (2) right to personal cultivation. Now let’s check the rights of tenants. If landowner can evict the tenant according to his whims-fancies=>this system leads to exploitation. Hence there should be fixed term and fixed rent. Meaning as long as the teant is within that xyz years lease limit and keeps paying that xyz amount of rent, you (landowner) cannot evict him. Insecurity of tenure is a big hurdle in the improvement of agriculture. Tenant pays little attention to the soil improvement, digging of well or tube-well and construction of embankment etc. This negatively affects agro productivity. Security of tenure is must for social justice as well. Hence, Most state made laws to provide at least 5 years tenure security. Assam Landowner cannot evacuate tenant, IF that tenant has been tilling the land for 3 years or more. Manipur A tenant could not be removed from a minimum area of 1.2 acres of the land, until he is given an alternative land. But tenant can be removed from the land if he fails to pay rent for two years or more OR if he transfers holdings to third party without permission OR damages the land. If he wants to resume personal cultivation. They lease the same land to third party. During British Raj, there was no law to protect farmers against high rents. The Zamindar/ landowner used to determine rent according to their discretion. Often, rent would be ~50-70% of the total produce. Result? Tenant farmer has hardly any surplus income left=>can’t buy hybrid seeds, fertilizers, pesticides, machinery, in short he cannot invest in agri.improvement. Therefore, after freedom, most state government passed laws to fix maximum rent in the range of 25-33% of the produce. Limitation: Although states had fixed Maximum rent in 20-50% range, but in most cases, the tenants had to pay rent in the range of 50-70%- especially in the areas with high productivity under green revolution. Corrupt District officials failed to enforce the rent limits. 6th Five year plan suggested the state governments to pass laws to bring down rents to ensure rents are not above 33% of the produce. Fixed rent: 25% of the produce. Meaning landowner (Jotedar) can only get 25% or 1/4th of the produce. While Sharecropper (Bargadar) gets 75% or 3/4th of the produce. Ok so far, tenant is given term-security (you cannot evict him before xyz years) and rent security (you cannot charge beyond xyz% of the produce). He joins politics and becomes a telecom/coal minister to mint truckload of cash. Therefore, most state laws also allow the tenant to voluntarily surrender the land back to the original owner. Challenge: Sometimes landowner might use bullying/coercion/gun-power to make tenant sign stamppapers declaring his surrender. Solution: Some states also have ‘verification’ procedure. e.g. in Andhra, after Tenant surrenders the land to owner, the Tehsildar will verify whether surrender was genuine or not. But then again- thinking in Bollywood terms: evil Landowner might kidnap Tenant’s family and order him not to complaint to Tehsildar. Andhra Tenant can buy after paying 8 times the annual rent. without paying money to original landlord. Limitation: Many small farmers had been tilling land on ‘oral agreements’, did not have paper records to prove 12 years. Madhya Pradesh Yes, if tenant pays 15 times the annual rent to the owner. Tenant has right to purchase land within one year of the commencement of tenancy. Challenge: Many tenants could not afford the large sum of money to purchase the land. Orissa Yes, if tenant pays 10 times the annual rent to the owner. Tamilnadu Government Abolished intermediaries but did not facilitate tenants to purchase land from the landlord. State laws already gave rent reduction + permanent occupancy rights= these superior tenants were for all practical purposes virtual owners. Hence there was hardly any motivation to try and acquire full ownership. Besides to get full ownership=> need capital (money) and legal complications. Compensation for tenant, if he made permanent improvements to the land such as, digging of well, planting of trees, construction of farm house, embankment, etc. During natural disaster/flood/drought etc. if government remits land-revenue to the landlord, the latter too will have to remit rent to the cultivator. In the next article, we’ll see the achievements and limitations of Tenancy reforms undertaken in India. Topic has been explained in lucid way. Happy Diwali to U Mrunal sir.And sorry for being off the topic but What a match b/w India and Aus finally India won Really Faulkner has the attitude of an UPSC aspirant that guy doesnt gives up till very end and forces us to think for a while that they can win the match even if they have tochase 384 runs from fifty overs. HAPPPPPPPY DEEWALI TO YOU MRUNAL AND YOUR FAMILY , FOR YOUR GREAT GUIDANCE AND EFFORT FOR STUDENTS, GOD GIVE YOU WHAT YOU WANT IN YOUR LIFE…. Happy Deepawali Sir, May God fulfill all of your dreams. well explained sir, it is comprehensive in covering all aspects. could you suggest us how to tackle essay for 250 marks. Under “Element1: Landowner’s right to lease”, you have mentioned that Orissa does not allow leasing or sub-leasing of agri land. However, under “Element2: Landowner’s right to Personal Cultivation” it is written that Orissa allows landowners can take back 50% of the leased land. In the above discussion, you have mentioned about the laws implemented in various states. Is it important to know which state is specifically providing which provisions? or a general idea should suffice like?